Every year when I pick up a new copy of the provincial Hunting Regulations Synopsis and leaf through it I experience a renewed sense of amazement at just how fortunate BC hunters are. All you have to do is head for your region’s pages and peruse the list of season dates for the various species of game available there in order to feel very, very privileged. We have game as small as quail to as large as moose available to us – with almost endless options in between. But this variety also raises a question that I’m frequently asked: “What in the heck kind of gun do I use to hunt this or that?” More often than not the person asking the question would like me to answer: “If you buy this one gun, it will do it all.” Unfortunately, it’s just not that simple. No one gun will do it all, and for me that realization was gleaned from attending a school of hard knocks that came with a very hefty price tag. 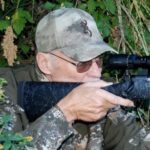 Having hunted all over the world I have been in constant pursuit of a combination of guns that will best meet the majority of my hunting needs. I have seen more guns pass through my safe and cabinets than I care to tally. But this parade of firepower has been useful, and has certainly helped me gain a solid understanding of which guns will offer a hunter the performance they seek when targeting the majority of BC’s game. Ruger K77 -22VBZ .22 calibre rifle. Image provided by Ruger. Browning T Bolt .22 calibre rifle. Image provided by Browning. The four barrels of the Sako Quad (the .22LR, the .17 Mach 2, the .22WMR and the .17 HMR) can add up to an ideal package for small game and small varmints. Image supplied by Sako. The Anschutz Model 1700 is a top of the line choice for a .22 calibre small game rifle that can double as a competition silhouette rifle. The author has owned a number of Model 1700s over the past 30 years and considers them worth every nickel invested. Image supplied by Anschutz. The T/C Predator, at a cost of less than $700.00, is one of the best (if not the best) bang for your buck predator rifles on the market. Image supplied by Thompson/Center. The Beretta Xtrema 2 is most likely the author’s favorite waterfowl shotgun. Image supplied by Beretta. The recently introduced Browning Maxus with all its innovative features is a first-rate waterfowl shotgun. Image supplied by Browning. The brand new Beretta Xplor is an excellent choice for upland game such as pheasant, but with its 3.5-inch chamber would be right at home in a goose blind as well. Image supplied by Beretta. The Browning Mountain Ti is probably the best mountain rifle the author has tested to date. With its extremely light weight, accuracy and all but indestructible construction, it would be right at home in BC’s mountains. Image supplied by Browning. 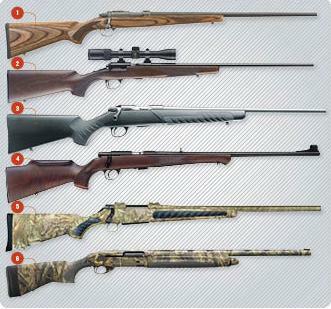 The Sako Model 85 is a first-rate big game rifle. With its inherent accuracy and design, it would be an excellent choice for hunting all of BC’s big game. Image supplied by Sako. The brand new Remington XCR ll, with its fine accuracy and Trinyte Corrosion Control System that is all but totally impervious to weather (including salty sea air), would make an excellent choice for any BC big game hunting situation. Image supplied by Remington. The Sako A7 is a less expensive big game rifle that can still deliver in the field. No battery of guns is complete without a small game rifle – it is unquestionably the most popular cartridge in the world. I have to admit that I have an ongoing love affair with this fine firearm, and when considering hunting small game in BC it is the only calibre that comes to mind. I grew up in southern Alberta in the very heart of jackrabbit country and, to the chagrin of my teachers, I used to spend far too much time daydreaming of the time when I could actually purchase my first .22 rifle. When that day finally arrived I laid down some hard-earned paper route money and purchased a Cooey single shot .22. While, by today’s standards, it was a very simple and inexpensive rifle, I spent countless hours walking the prairie grassland hunting small game with it. Since those humble beginnings I have owned more .22 rifles than any other calibre, and I have hunted countless small game animals with them, from rabbits to upland birds. They are deadly accurate and, with their mild report and all but nonexistent recoil, they are a pleasure to shoot. With the right ammunition they have plenty of punch to take all of BC’s small game. I presently own a number of .22 rifles, including two high quality bolt actions – an Anschutz and a Kimber, both of which are topped with Leupold scopes. They are unnervingly accurate and no doubt the reason that many a head shot grouse has found its way into our freezer. Over the years I have owned more Anschutz .22 rifles than all others combined. The reason is simple: I was heavily involved in competitive shooting and therefore required the most out of each and every gun. While they all shot exceedingly well, they are pricey. So, if you are looking for something a little more affordable, a Remington Model 547 is a bit cheaper and the Browning T Bolt and the Ruger Model 77 are considerably less expensive. Or, if you are looking for the versatility of a small game/varmint rifle all rolled into one, consider the Sako Quad with its four barrels (.17 Mach 2, .17 HMR, .22 WMR and a .22 LR). In my test of this rifle a few years back every barrel shot very well. While the choices are all but unlimited, from autoloaders to target rifles that can push your budget into the stratosphere, here is my recommendation: purchase as good a quality bolt action rifle as you can afford and mount a decent rimfire 2-7x or 3-9x scope on it. Stock up on CCI small game .22 ammunition and you are field ready for that next small game hunt. I started hunting coyote and fox in Saskatchewan way back in the mid-60’s with a .300 Winchester Magnum. To say that I was over-gunned would be nothing short of a monolithic understatement, but it was the only rifle I owned at the time and, needless to say, “it killed them dead”. So dead, in fact, that the hides were unsalvageable and over time, due to all the shooting I was doing, it cost me the barrel on that rifle. On the positive side, it did improve my shooting ability with that particular firearm, as I became pretty proficient with some long-range shots on big game. I got to know that gun intimately, and after shooting at something as small as a fox from 250 metres, a deer at 350 or 400 metres started looking a lot easier than it did before. But that was the only upside to the equation, as not only did I have to replace a burned-out barrel but the rifle itself also took a lot of abuse from my hunting with it every wintery day I could escape into the hinterland. After a couple of winters I knew I had to make a radical change. So I bought what I considered to be a crossover or dual-purpose rifle – a .243 Winchester. It was fun to hunt with, but still devastating on hides. I even tried loading solids but found they did not kill as effectively as I would have liked, so, despite the cost of another purchase, I bought my first predator rifle: a heavy barrel Remington .22-250, mounted with a 4-12x scope. With the coyote hides I was now able to salvage, I more than paid for that rifle and scope over the next two winters. It also paid for the majority of my first outfitted big game hunt into the Northwest Territories for Dahl’s sheep and caribou. I have long since lost count of how many coyotes I shot with that rifle, and a number of its successors of the same ilk, but it was considerable. I have tried a number of alternatives by both up and downsizing in firepower, but have always returned to the .22-250. It is one fine cartridge with plenty of authority to take any BC predator, even a wolf with the right load. However for predators a rifle, in addition to its lethality, must also be extremely accurate. With a kill zone of only six or seven inches a coyote at 350 metres offers a very small target indeed. A rifle must, in my view, shoot consistent sub Minute Of Angle (MOA) groups, preferably a half-inch or less. In addition to my historic favourite, the Remington Model 700 heavy barrel, I have recently been privileged to test a number of very fine predator rifles. The most recent and potentially the best bang for your buck is the Thompson/Center Venture Predator. It shot half-inch groups for a modest price of under $700.00. The Tikka T3 Varmint shot equally well and is certainly worth a close look at just a tad over $1000.00. 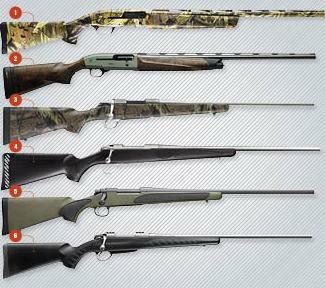 Every BC hunter with any intention of hunting birds will require at least one shotgun. While BC may not rival the Prairie provinces for their bird hunting opportunities, it can still boast of site-specific hunting that is as good as what one will find to the east. As to gauge, if you are only going to own one shotgun I would opt for a 12 gauge and then add a 20 later on. Other than for late season pheasant hunts I actually prefer a 20 gauge for upland birds as they are generally faster on point. However, for waterfowl the Beretta Xtrema II or the Browning Maxus in a 12 gauge are about the best one can find. If cornered on the issue I would have to give the nudge to the Beretta, with its recoil-reducing Kick Off System. It is the finest waterfowl gun I have ever owned. Despite this high praise, when hunting upland birds I would opt for the Beretta Xplor. This stems from my bias for a traditional wood stock, as I just can’t seem to get over the hurdle of hunting upland birds with a camo synthetic stock. I also hate to be the bearer of costly financial news, but if you become as addicted (as I am) to bird hunting, you will most likely own at least two shotguns – one dedicated to waterfowl and one to upland birds. While BC may not quite measure up to other western Canadian hunting venues in some respects, it surely surpasses the majority when it comes to the game of our mountain peaks. All one has to do is look at a map to understand just how much of our province is covered by mountains. To hunt these lofty vistas one requires a rifle that is light (preferably less than 6 pounds) and compact (maximum barrel length of 22 inches). It also must be impervious to the weather, all but unbreakable, and, of course, shoot flat and accurately with enough jam to flatten an old billy goat. I spent the early part of a lifetime searching for that perfect mountain rifle, and after years of trying this or that with little success, Remington finally introduced something that for its time (this was a few decades back) was almost everything I had been looking for (I’ll get to the almost in a moment). I bought two, one in a 30-06 Springfield and one in a .280 Remington. Because they both shot very well, and because of their relative light weight and portability, I hunted with them all over the globe. Now for the down side. Both were long actions with steel barrels and wood stocks. As a result I always yearned for a rifle that offered a shorter action in an all-but-weatherproof configuration. Well, I was not the only hunter looking for such a rifle. Manufacturers began to heed our cries from the wilderness and began building an array of models just for those of us that feel the need to make those gut-wrenching climbs for game that speak to our innermost self. Potentially, the best I have yet to test is the Browning Mountain TI. At a weight of only 5 pounds and 8 ounces it is all but indestructible, and in the shorter action .270 Winchester Short Magnum it shot my handloads consistently into under an inch. And, despite its light weight and shorter barrel, it balanced very well. If you then mount a 2-7x or 3-9x scope on it, such as the Leupold Ultralight at less than 9 ounces, you will have a mountain rifle of roughly 6 pounds that is about as good as one can find. About now you may ask why one needs another rifle for big game if you have already acquired a mountain rifle. The answer is that you can certainly use a single rifle to do both. I certainly proved that with my Remington Mountain rifles; I shot game as large as gemsbok, kuku, mountain zebra, and mountain caribou. I even killed a monster 67-inch Alaska-Yukon moose with one. However, my preference under normal circumstances – particularly in the case of moose, elk or large bears – is to hunt with a rifle that is designed for cartridges capable of more firepower. That usually equates to something a bit heavier and longer – a rifle designed for a cartridge that will drop a large bull moose in its tracks, like the .300 Winchester Magnum (one of my all-time favourites) or one of its close relatives. I have always been of the opinion that bigger is better when it comes to the heavyweights, and if a light mountain rifle were to be chambered in a cartridge of that size recoil could become a real issue. You would be loosening your teeth every time you pulled the trigger – something to be avoided at all costs. I also like the fit, feel and balance of a standard-sized rifle, particularly when shooting at longer ranges where that extra weight can add stability. I have recently tested three rifles that not only fit these criteria, but shot exceedingly well with both handloads and factory ammunition. First was a Sako Model 85, followed most recently by the Weatherby Vanguard MOA (full review in the fall issue of BCO H&S), and, lastly, the Remington XCR II. The new Remington XCR II is one of the best-built rifles for the BC climate that I have yet to encounter. It has a Trinyte Corrosion Control System that is all but impervious to the weather, and that even includes salt water. What a coastal bear rifle this will make! Top any of the three with a good 3.5 -10x scope and count down the days until fall’s moose or elk season.